Spring Break was a happy week! Time off from school/work, staying up late, sleeping late, reading a lot, privacy with DH (since the kids were gone most of the time) and a short trip to San Antonion and Fredericksburg. Walking on the San Antonio Riverwalk (before it gets crowded). Spending time with my sister. 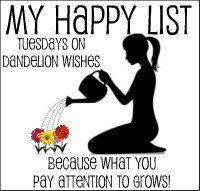 What's on your happy list today? Link up with Mamarazzi! Fun! Looks like a great trip! Have a fabulous week! Looks a Happy spring Break :o) I lived in San Antonio as a kid and then again for a bit shortly after being married. What a wonderful Happy List! I am so glad Spring Break was good to you. What a great Happy List! Visiting with sisters always makes me happy too. Ohhh a winery... FUN! We have sooo many around here, but I have only visited 2 or 3. I want to get a group of girls together to do a tour where they take you to a few. They do it really cheap since a lot of the wineries are so close together. How fun would that be!